The vast majority of us have probably, at some point, backed up the data on our devices—whether it’s in the form of a Nandroid backup or just using Titanium Backup (other backup apps are available) to preserve your applications and their relevant data. There are many reasons why you might want to do this, whether its for restoration after flashing a new ROM or just for posterity in case of disaster while tinkering around. Another reason you might want to backup data is because you want to unlock your bootloader, and doing so often requires your device’s /data partition to be wiped. However if you haven’t unlocked your bootloader then chances are you don’t yet have root access, which makes backing up significantly more difficult. 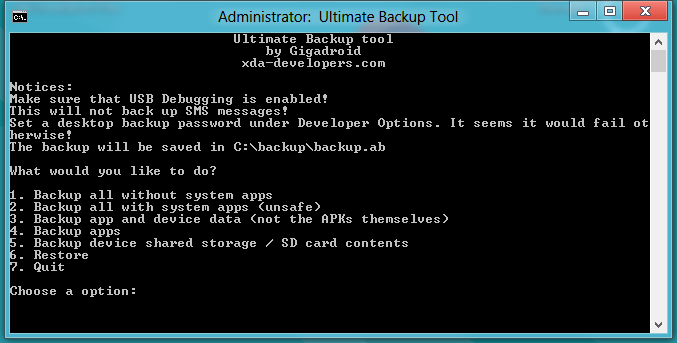 Well not anymore, as XDA Forum Member Gigadroid has created a Windows-based tool that allows you to back up various different types of data and restore them, all without root access. It’s worth mentioning that this is not like a nandroid backup which is effectively a snapshot of your current device set up, this backs up apps, app data and information stored on the internal/external SD card. The way this works is because of the greater permissions given to ADB compared to apps run on the phone itself, which carries with it its own potential risks. In other words, once done backing up your data, you should consider turning USB debugging back off. The tool was tested on a Galaxy Nexus, but should work on any device running Android 4.1 or above with USB debugging enabled. Slide on over to the original forum thread to find out more.